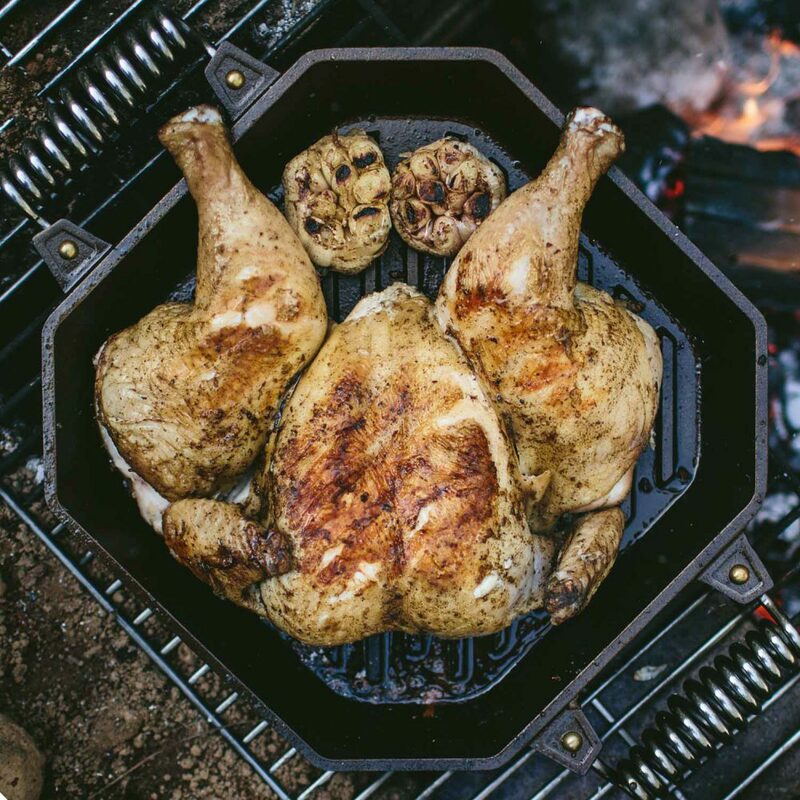 5-Ingredient Grilled Spatchcocked Chicken | FINEX Cast Iron Cookware Co.
One of the best ways to get grilling with our 12-inch Twin Spring Cast Iron Grill Pan is to spatchcock a whole chicken and grill over the coals. It looks harder than it is, and this recipe serves up enough for the whole family. Our friend Eva Kosmas Flores from Adventures In Cooking was kind enough to share this delicious recipe with us. Next time you have the BBQ out or you’re on a beach with a low and slow fire, give this a try. In a charcoal grill or campfire, preheat coals until they’re pale grey and glowing orange, or start burning down the wood until they’re glowing orange and started flaking off a little ash (will take about 30 minutes). Spatchcock the chicken by laying it on its breast so that the back is facing up. Use a very sharp pair of kitchen shears to cut along one side of the backbone, cutting as close to it as you can without actually cutting through the backbone itself. Cut along the other side of the backbone until it is separate from the bird. The backbone can be saved and used for chicken stock or discarded. Flip the bird over so that the breast is facing up and the back muscles are splayed out on either side of the breast. Press down firmly on the breast of the bird with the heel of your hand to break and flatten the breast bone. Brush the raised strips of the grill pan with 1 teaspoon olive oil. Rub the chicken inside and out with 1 tablespoon olive oil, thyme, and salt until coated. Place the chicken breast side up in the grill pan. Drizzle the garlic heads with the remaining 2 teaspoons olive oil and place them in the FINEX 12-inch Twin Spring Cast Iron Grill Pan, cut side facing up. 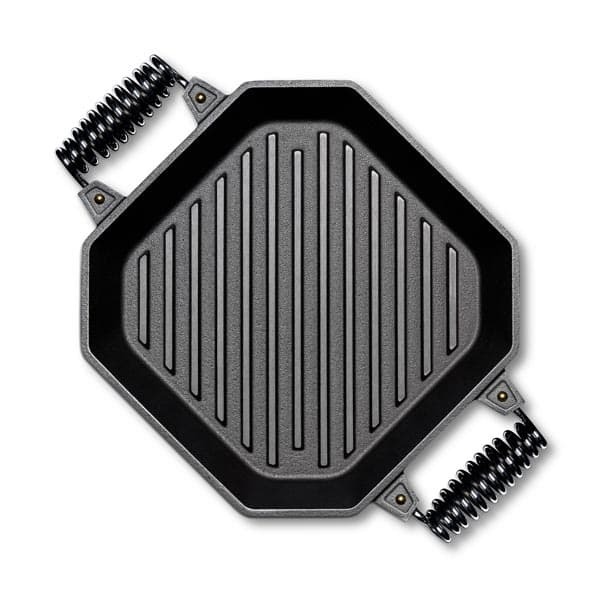 Place the pan directly over the hot coals and cook until the bird’s skin is golden, lightly charred around the edges, and the temperature in the breast and which reaches 165 degrees Fahrenheit, about 45 minutes to 1 hour (the tie will vary depending on the heat of your fire), turning once. Serve the chicken along with the roasted garlic bulbs.